Oil, war, love, treachery, and revengeThe story begins with the fall of Shanghai in 1948. Chiang Kai-shek’s government, about to be defeated by Mao Tes-tung, is fleeing to Taiwan. A young CIA agent promised a wealthy Chinese, Sing Lau, that he would arrange safe passage to the U.S. for his family. But first they must pay a multi-million bribe to the Kuomintang. The CIA agent picked up most of the gold, leaving the family $3 million, but the departure flight was delayed several times. The college aged son of the family, Sing Han, did not trust the Americans to keep their word, and began searching for another means of escape. When he returned home after finding a ship, he found his mother, father, and sister dead and his home on fire. Believing that they were betrayed by the CIA, the son swears an oath of revenge against the CIA agent and the U.S. An pledge he will do anything to keep.1LT Sam Weber, USMC, volunteered to serve in Viet Nam. His first assignment was in Intelligence. Disgusted with the rear echelon officers, and how the war is being conducted, he requests a transfer to a combat unit. In 1967 Weber is selected for a top secret mission into Laos to find an arms depot. Captured by the Laotian guards, he meets a beautiful college girl, Sing Liang. They fall in love and she helps him escape. Her father, Sing Han, is the arms merchant supplying arms to the Viet Cong. Han attempts to capture Weber, but Weber escapes, providing a harrowing adventure. Weber searches for Liang, but cannot find her. Weber has identified Han as the arms merchant, and the CIA send an operator to his house in Hue. The operator kills Han’s wife, and Han swears an oath of revenge against Weber, who knew nothing about the killing.The author jumps the story forward, sometimes by a year, and sometimes by several years as he weaves a complex tale of love, hate, and revenge. The plot is guided by the subtle hand of Sing Han, who is a brilliant businessman, driven by his insane haltered for the U.S., the CIA agent that betrayed his father, and Sam Weber who caused the destruction of his hidden armory in Laos and stole his daughter’s heart.Sing Liang and Sam Weber find each other years later. Liang has a daughter. Her lover was killed before they married, and Sam is divorced with no children.Sing Han has built a world wide business empire, and used the money to finance his grand plan for revenge—manipulate the price of oil, causing debtor nations to default, bringing down the U.S. economy. Sam and Liang discover his plan and attempt to stop it.The reader is provided a basic understanding of accounting and audit practices as one part of the story. In another part, oil well drilling is explained. Both are well written, informative, and entertaining. The author also does an excellent job of describing geographical locations. I particularly enjoyed his description of Singapore, a place I have not visited.THE WHIPLASH HYPOTHESIS is a well written and well edited book. The Viet Nam segments are realistic, reflecting the author’s personal knowledge and experiences.Will Sing Han destroy the CIA agent and his family? Will he crash the U.S. economy? Will he succeed in breaking up Liang and Sam? You must read the book to find out. I thoroughly enjoyed the story. Don Westenhaver - As a boy, I wanted to be a Catholic priest, but then left the seminary because I didn’t want someone else controlling my life. Making the same mistake a second time, I then joined the Marine Corps. The Marines trained me to be a Vietnamese interpreter, but then assigned me to be a platoon radioman near the DMZ. Returning home in one piece, I became a finance executive in the oil industry, traveling frequently to Asia, Europe, Latin America and Africa. 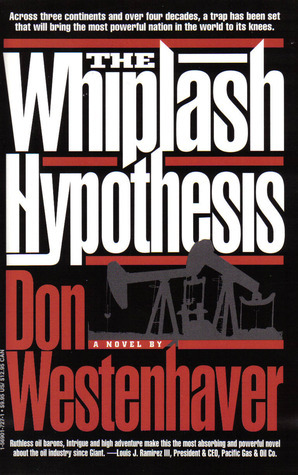 My military and oil business experiences inspired me to write my first novel, an international thriller titled The Whiplash Hypothesis. My next job was as a finance director for a Japanese auto company, where I gained more inside knowledge of international business. During the 1990s, I became fascinated by the Asian Tigers, a group of former Third World countries such as South Korea that were emerging into First World status. Inhabitants of very poor nations were suddenly enjoying huge improvements in their standard of living. I speculated that a relatively small amount of money could propel Vietnam onto the same growth track, because its culture prizes education and hard work. It only required an intelligent plan encouraged by a Communist minister who was secretly a capitalist. The result of this was my second international thriller, The Red Turtle Project.During a vacation in Italy I loved the ruins of Pompeii, which display in such vivid detail the lives of ordinary people 2,000 years ago. The Romans were like us in many ways, and they took for granted advances in technology that would soon be lost to mankind for a thousand years. I studied ancient Rome for the next four years and created characters and a plot that begins with the Great Fire of Rome. Emperor Nero, usually portrayed as a psychotic monster, actually began his reign as an enlightened teenager guided by moral principles. The plot of Nero’s Concert illustrates Nero’s descent into madness as told by his best friend. The backdrop is the Fire, the search for who caused it, and the collision of the new Christian religion with Roman culture.I have been married to my wife Ellie for almost 40 years. We live in Southern California and have two grown daughters and two grandchildren. We recently retired and spend our time traveling, assisting four different charities, golfing, and of course playing with the grandkids. I have finished my fourth novel and am a member of the Southern California Writers Association and the Military Writers Society of America.